With sand, buckets and a knack for detail, artists will descend on San Diego’s waterfront this Labor Day weekend for a sand sculpting competition known to leave spectators awestruck. The 7th annual U.S. Sand Sculpting Challenge & Dimensional Art Exposition presented by the Port of San Diego goes down at Broadway Pier Friday through Labor Day, showcasing elaborate works of art created entirely out of sand. 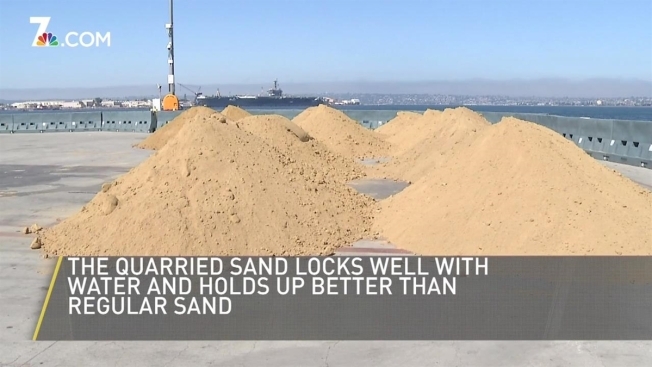 On Monday, 300 tons of sand will be dumped at the Broadway Pier, transforming the pavilion into an indoor sandy oasis that will extend to the beach along San Diego Bay. The sand will be used by international sand artists vying for first place in the competition, including two-time winner, Ilya Filimontsev, of Russia, who took the prize home in both 2017 and 2016. The competition brings world master class sand sculptors from around the world to San Diego to build and carve sand sculptures as the event unfolds. For non-sculptors, the family-friendly event includes live entertainment, gourmet food trucks, a beer garden and a kid’s zone with a large zone with hands-on activities including sandcastle building classes taught by professional artists. In the past, the event has been named one of the top 20 must-see seaside festivals in the world by USA Today’s 10 Best. In addition to taking in the sand sculptures against the backdrop of the bay, attendees can also peruse and buy more than 1,000 works of art – from metal, wood and glass to jewelry, handmade clothing and wall art – in the Dimensional Art Exposition portion of the event. The U.S. Sand Sculpting Challenge gets underway with preview night Friday from 5 p.m. to 9 p.m and continues 10 a.m. to 9 p.m. on Saturday and Sunday and 10 a.m. to 7 p.m. on Labor Day. Tickets range from $8 to $13 for adults and $7 to $9 for kids, for advance tickets but tickets will be available at the gate. Admission is free for active duty military and first responders with identification. Since the waterfront gets crowded on the holiday weekend, visitors may want to take public transit to the event. The MTS trolley and bus, as well as the North County Coaster and Amtrak trains, drop passengers off at America Plaza/Santa Fe Depot, which is one block south and two blocks east of the pier. For more details, visit the event website.